Thracian Tomb with Wall Paintings beside Alexandrovo village is part of the Tentative list of Bulgaria in order to qualify for inclusion in the World Heritage List. The tumulus near Alexandrovo village was only investigated in the early 2000s. The tomb discovered inside is completely painted. 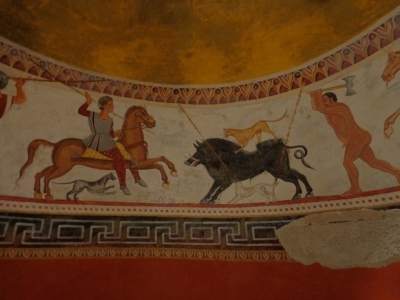 While the paintings at Kazanlak WHS show a clear influence from Hellenic culture, the hunting scene depicted at Alexandro show people dressed (allegedly) in the “original” Thracian way and this, associated with the good preservation state of the paintings, was the reason to have this tomb on the TWHS list of Bulgaria. The original tomb is closed and only a replica can be visited in the nearby museum. It was built a few years ago, funded by Japan. There is only one big room, with the replica in the middle (you can walk inside and around) and many pictures and explanations posted on the walls. We thought this replica is more “visitors friendly” than the one in Kazanlak. Staff of the museum was nice and helpful as well. The tumulus with the original tomb can easily be seen from the museum, and you can also walk to it. So we did, although, frankly speaking, this did not add much to the visit, but the feeling to have (maybe!) entered a “tentative core area of a tentative WHS” (which, for a WHS hunter, is finally far from nothing). The museum is interesting and of good quality, not far away from the Sofia to Turkey highway, and the visit does not take long: only good reasons to stop there. However, our car was the only one at the car park when we came back after the visit of the museum, so we can only encourage travellers to stop there.